You’ve probably (or maybe seen their Facebook ads) heard of pagemodo, a service to help you build your Facebook page. Today I decided to take it for a test drive. First a clarification, a Facebook Fan page is actually a number of pages (or tabs), the most familiar being your Wall, so what pagemodo will build for you is a new “tab” for your Facebook page. For example you might want to create a landing page to welcome new fans to your Facebook page, this is a good candidate for a pagemodo created page. You will still need to create your actual page in Facebook before pagemodo installs the “page” you built, however pagemodo detects this and directs you over to Facebook to do this prior to installation. As you might suspect, the free version of pagemodo is of limited functionality, and more features are available in various paid versions ranging from $6.25 to $33.25 a month. The free version allows you to create one page with several graphics. Video is not available in the free version and if you don’t want the pagemodo footer advertising itself you have to select one of the paid versions. I was also not able to create any links in the free version, which seems to be a severe drawback – however I have not investigated this fully to see what exactly the problem is. Unfortunately none of the versions offer the ability to embed an opt-in, which was one of my primary drivers to check out pagemodo, it is “coming soon”. If you want a eye catching graphics rich page to feature your business wares or other photos, pagemodo could be a good fit for you. Most of the templates require several pictures which is good to know up front. The user interface is fairly intuitive although given to some glitches. I lost my work when I clicked away to check out their questions and answers on how the Facebook page creation works (as mentioned above, you have to create the page separately in Facebook). The graphic “sizer” helps you scale your pictures so that they fit into the template. Here’s my free pagemodo Facebook welcome page. I don’t know if I will keep it long term, but it’s there now. Pagemodo released an update, 2.0, on June, 27, 2011. There are more layouts to choose and some new features, such as coupons, facebook “Like” gates and more. You CAN create links in pagemodo, just not the way you think you can. What you do is attach a link to a text box and that text box becomes clickable. Now this then presents the problem of how to let the visitor know there is a link to click on. Unfortunately you can not style part of the text box, so you are left with styling the entire text box (ie. with colors and underlining). It’s definitely limiting but better than no linking capability at all. I’m not aware of any, but I haven’t done the research. I think there is an opportunity here for more entrants into this niche. Hey Kathy, thanks for a great & fair review. We hope that the new Pagemodo makes it even easier for you to create a Facebook page for business, and I’d love to hear any feedback that you might have on our new release! Thanks David, the new version is very nice! 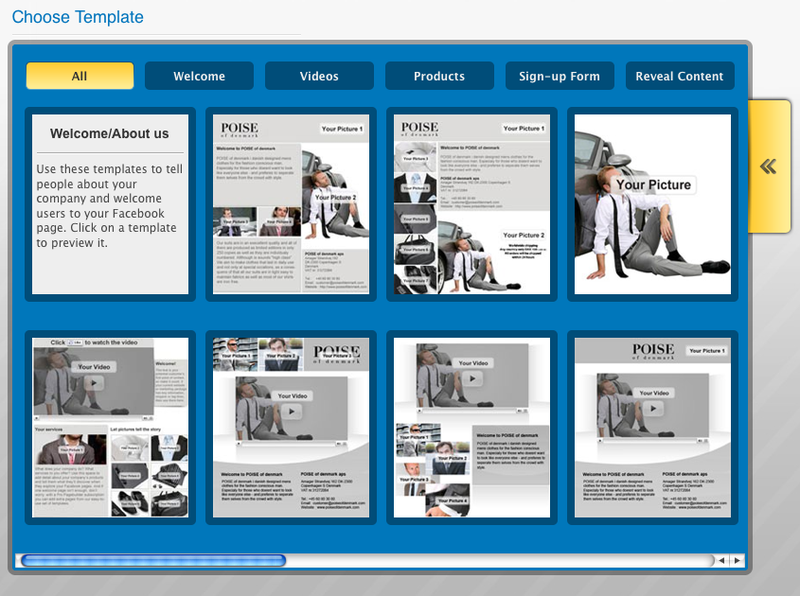 More choice of templates and a nicer interface. I have a facebook page already that I wanted to use to promote myself. Can I use Pagemodo to modify that profile page that already exists or do I need to start a new page? You can use Pagemodo to create a new tab (or link) within the Facebook page you have created. Then, if you want, you can set that as your default so that’s what people see when they land on your Facebook page. We just launched our own app called Pholiofy.com – Let us know what you think! You should be able to make it your landing page. There is a default landing tab dropdown you can set when you edit your Facebook page. Kathy, How did you get your Pagemodo to be your landing page on facebook??? I have tried everything and its still not coming up when I open my page grrrrrrr. What good is Pagemodo if you can’t add it as your landing page. I fear I have just wasted 2hrs of my time. Would be helpful if the people at Pagermodo told us ahead of time about this. Grrrrrrr!! I was wondering how to make my links open in a new window. Now when I click on them they open inside the facebook page. You would want to be able to specify target=”_blank” in the link HTML code and I don’t think you can do that with Pagemodo, I would ask them. I’m not entirely sure what you mean. The free version limits you to one pagemodo page (tab) on one fan page. You can put a facebook widget for your fan page on any number of sites that you wish, but if you are talking about multiple facebook fan pages, then you need more than just the free version of pagemodo. Pagemodo breaks the back button in Firefox and IE8. Looks like they use a “Refresh” instead of a “Redirect”. Too bad, because it looks pretty good, but I don’t want anyone viewing my page and getting trapped…..
Hi Tubbypascal – would you mind elaborating? Is this something you can see by inspection of the HTTP headers? 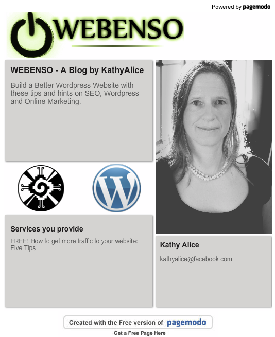 kathy….i was wondering if you’re using pagemodo instead of a website? i was thinking of switching, but still unsure of how it’s used. i’m trying to find a other businesses that use it just to get some other ideas. I haven’t been able to get my tab to update. I’ve clicked the publish button over and over and the new edited draft does not show on facebook. Am I doing something wrong? Pagemodo is nothing but a rip off business and I warn you all from using them. I signed up for their annual package and I was suppose to get a discount which I did get after some time. After 4 months they took out another $159 from my account again, now I’m fighting to get that amount back. I’m going to make a complaint with my credit card company tomorrow. I’m not getting anything out of the pagemodo page at all since it’s not doing a single thing for what I already have for free. Don’t waste your money here…. they will rip you off. Beware of your credit card balance so they don’t start taking out money before your membership is even half way up. Will update as I’m trying to work things out with them. Also, I don’t like the fact I don’t have a personal costumer service line to call and discus issues with. Stay away! Thanks for the heads up about Pagemodo. Lots of companies don’t handle the reoccurring charges well, and people find they have to complain. Don’t get me started on fitness memberships… Pagemodo is good for people who don’t want to design their own Facebook pages – they seem to be targeting local businesses, but it’s not a fit for everyone. So paying for the pro is not a rip off ? Did anyone else have the pro or paid for anything on fb? Does it really help your business to purchase the Like GATE? I’m not a huge fan of using Like’s as a Gate for entry. Unless you are offering something of good value (like a decent discount coupon) for the Like.